Myasthenia gravis (MG) is a debilitating autoimmune disease where autoantibodies against neuromuscular junction (NMJ) proteins impair neuromuscular transmission and cause fatigable skeletal muscle weakness. Approximately 5% of patients with MG has autoantibodies against muscle-specific kinase (MuSK).1 These autoantibodies are predominantly of the IgG4 subclass.2 IgG4 is considered an “anti-inflammatory” antibody being unable to bind complement or many Fc receptors on immune cells.3 IgG4 antibodies furthermore exchange Fab-arms with other IgG4 molecules, which renders them functionally bispecific and monovalent, preventing antigen crosslinking and internalization.4 Consequently, the pathogenicity of MuSK IgG4 autoantibodies was initially questioned.5 However, retrospective longitudinal epitope mapping with polyclonal serum showed that disease severity correlates with IgG4 reactivity against the N-terminal Ig-like 1 domain of MuSK.6 Furthermore, passive transfer of purified IgG4 from patients with MuSK MG dose dependently induced muscle weakness in mice.7 Last, in vitro studies showed that MuSK IgG4 autoantibodies block MuSK-LDL receptor–related protein 4 (Lrp4) interaction, thereby preventing acetylcholine receptor (AChR) clustering, which explains the impaired neuromuscular transmission in MG.8,–,10 It is now well established that MuSK IgG4 autoantibodies cause MG.
To further understand the pathomechanism of MuSK MG and investigate whether the unique functional features of IgG4, like Fab-arm exchange, contribute to the pathogenesis, we isolated and functionally characterized monoclonal MuSK antibodies from patients with MuSK MG. Patients with MuSK MG were recruited in our MG outpatient clinic at the Leiden University Medical Center and were selected based on the presence of a positive MuSK antibody test (RSR Ltd). Both patients were symptomatic and on immunosuppressive treatment, whereas 1 patient had been previously treated with rituximab. The study was conducted in accordance with the Declaration of Helsinki and was approved by the local medical ethics committee. Both patients signed informed consent. Heavy and light chain sequences were ordered at GeneArt (Thermo Fisher) in an IgG1 and IgG4 backbone pcDNA3.1 vector and transfected in suspension FreeStyle HEK293-F cells (R790-07, Thermo Fisher) using Fectin (12347-019, Thermo Fisher) in FreeStyleTM 293 Expression Medium (12338, Thermo Fisher). To increase transfection and production efficiency, the cells were cotransfected with SV40 large T antigen, hp21, and hp27 (kindly provided by Theo Rispens). After 6 days, culture medium was collected, cell debris was removed by centrifugation, and immunoglobulin G (IgG) was purified using a HiTrap Protein A affinity column (17-0402-01, GE Healthcare) on an Akta Pure (GE Healthcare). Antibodies were dialyzed to PBS, filter sterilized, and stored at −20°C. Fab fragments were generated from these recombinant antibodies using papain according to the manufacturer's instructions (20341, Thermo Fisher). To determine the binding characteristics of the recombinant antibodies, we performed an epitope mapping ELISA.6 Recombinant antibodies were used to immunostain fixed mouse levator auris longus muscle at 1 μg/mL overnight at room temperature. Synaptic regions were labeled with 0.5 μg/mL AlexaFluor488-conjugated α-bungarotoxin (B13422, Thermo Fisher), and bound recombinant antibodies were detected with 0.5 μg/mL AlexaFluor594-conjugated goat anti-human IgG (A110414, Thermo Fisher) in PBS for 1 hour. Muscles were imaged on a Leica SP8 confocal laser scanning microscope and analyzed using LasX software. To determine the ability of the antibodies to inhibit MuSK phosphorylation and AChR clustering, we exposed C2C12 myotube cultures (Cell Lines Service) to them as described previously.8 Differentiated myotubes were stimulated with 0.1 nM agrin (550-AG-100, R&D systems) in the presence or absence of 100 ng/mL recombinant antibodies or Fab fragments. For MuSK phosphorylation data, myotubes were lysed after 30 minutes of exposure, and MuSK was precipitated using 5 μL/sample rabbit anti-MuSK polyclonal serum (ab94276 or ab94277, a kind gift of Steve Burden) during an overnight incubation at 4°C. Bound antigen-antibody complexes were precipitated using protein A agarose beads (11134515001, Roche), which were extensively washed. Samples were subsequently ran on sodium dodecyl sulfate polyacrylamide gel electrophoresis and transferred to polyvinylidene difluoride membrane. MuSK and phosphorylated MuSK were detected using goat anti-rat MuSK (AF562, R&D systems) and mouse anti-phosphotyrosine clone 4G10 (05-321, Millipore) as primary antibodies and donkey anti-mouse-680RD (926-68072, Licor) and donkey anti-goat 800 CW (926-32214, Licor). To confirm equal loading, whole cell lysates, that formed the immunoprecipitation input samples, were analyzed for tubulin levels using a mouse anti-α-tubulin antibody (T6199, Sigma) and donkey anti-mouse-800 CW secondary antibody (926-32212, Licor). Bound antibodies were detected using the Odyssey CLx (Licor). AChR clustering was studied after 16 hours of exposing myotubes to 100 ng/mL recombinant antibodies or Fab fragments in the absence or presence of 0.1 nM agrin. Subsequently, the cells were washed 3 times with differentiation medium (DMEM, 31966 Gibco, 2% heat-inactivated horse serum 26050-088, Gibco, 1% pen/strep and 1% l-glutamine) and incubated with 0.5 μg/mL AlexaFluor488-conjugated α-bungarotoxin (B13422, Thermo Fisher) in differentiation medium for 30 minutes at 37°C. After staining, cells were fixed in 4% formalin solution for 5 minutes, washed with PBS, and mounted using Hardset Mounting Medium (H-1500, Vector Laboratories). Twenty fields divided over 2 coverslips per condition were randomly selected and imaged with the Leica DM5500 microscope. AChR cluster count and size were analyzed using ImageJ (1.48v). MuSK phosphorylation studies were performed in duplicate, and AChR clustering was performed in triplicate. All data are expressed as mean ± standard error of the mean. Statistical significance of differences between treatment groups was tested with Student t-tests, with corrections for multiple testing wherever appropriate. Differences with p values <0.05 were considered statistically significant. All data related to this article will be made available on request by a qualified investigator. To obtain MuSK-specific B cells, PBMCs were isolated from 2 patients with MuSK MG. The clinical characteristics of these patients are described in table 1. Antigen-specific single-cell sorting yielded 8 MuSK-binding B cells from 2 patients with MuSK MG. The frequency of circulating MuSK clones was ∼7 per 100 million PBMCs for patient 1 and 2.5 per 100 million PBMCs for patient 2. An overview of the isolated MuSK autoantibody characteristics is shown in table 2. From 6 of 7 MuSK autoantibody–producing clones from patient 1, we could derive the variable region sequences of the heavy chain (VH) and light chain (VL). For 1 clone, only the VH region could be sequenced. Surprisingly, the majority (5/7) of the antibodies isolated were of the IgG1 isotype. We furthermore isolated 1 IgG4 and 1 IgG3 clone. All IgG1 clones and the IgG3 clone used the same VH and VL genes (IGHV3-21 and IGKV1-39), suggesting a clonal relationship. Fab-arm exchange is an important feature of IgG4 and might affect the functional characteristics of MuSK autoantibodies.14 Previous work on polyclonal purified fractions suggested that MuSK MG IgG4 has the ability to undergo Fab-arm exchange.14 We sequenced the Fc part of our MuSK monoclonal antibodies and confirmed that the IgG4 clone indeed possessed the serine at position 228 and the arginine 409 required to undergo Fab-arm exchange (data not shown). N-linked glycosylation of the Fab can be important for antigen binding, e.g., in rheumatoid arthritis ACPA autoantibodies.15 The NXS/T (where X cannot be a proline) N-linked glycosylation motif was found in the variable region of two of our monoclonal MuSK autoantibodies, suggesting that glycosylation of the Fab is not essential for all MuSK autoantibodies. The Ig-like 1 domain of MuSK was previously recognized as the main immunogenic region (MIR) of MuSK in polyclonal patient IgG4 fractions and serum.6 For 5 of the patient-derived MuSK antibodies, the epitope mapped to the first Ig-like domain of MuSK (table 2). We have thus far identified no monoclonal autoantibodies against other domains. To establish the functional characteristics of the MuSK autoantibodies, recombinant antibodies were produced from an original IgG1 and IgG4 isolated clone. To assess the importance of autoantibody subclass in MuSK MG, each of these variable regions was subcloned in both an IgG1 and IgG4 backbone. We produced biotin antibodies as a negative control for all experiments. To assess the ability of recombinant patient-derived IgG1 and IgG4 MuSK antibodies to bind to MuSK at the postsynaptic membrane of NMJs, we performed immunostaining on isolated mouse skeletal muscle. Both the IgG1 and IgG4 versions of the recombinant monoclonal MuSK antibodies clearly bound to NMJs (figure 1, data shown for the IgG4 recombinant antibodies). Control biotin antibodies did not stain the NMJ. Scale bar is 25 μm. MuSK = muscle-specific kinase; NMJ = neuromuscular junction. Successful neuromuscular transmission depends on properly clustered AChR, a process that is orchestrated through the agrin-Lrp4-MuSK signaling cascade.16 Agrin is released by the motor nerve terminal and binds Lrp4, which subsequently binds MuSK and thereby stimulates MuSK homodimerization and transphosphorylation. Activation of MuSK phosphorylation stimulates a variety of intracellular signaling cascades of which one culminates in AChR clustering. Purified polyclonal patient IgG4 MuSK autoantibodies inhibit MuSK-Lrp4 interaction, subsequent MuSK dimerization and phosphorylation, and thereby prevent agrin-induced AChR clustering in C2C12 myotube cultures and cause myasthenia in mice.7,–,9 Surprisingly, patient-derived recombinant MuSK monoclonal antibodies (both IgG1 and IgG4) activated rather than inhibited MuSK phosphorylation (figure 2A). This effect was observed in both the absence and presence of agrin. Activation of MuSK phosphorylation was concentration dependent (figure 2B) and differed slightly between the 2 clones. This shows that patient-derived bivalent monospecific MuSK antibodies binding the Ig-like 1 domain facilitate dimerization and activation of MuSK in vitro. Bivalent monospecific recombinant MuSK antibodies (clones 11-3F6 and 13-3B5) activated MuSK phosphorylation in the presence and absence of agrin (A). Activation of MuSK phosphorylation was dose dependent (B). Clone 13-3B5 was slightly more potent compared with 11-3F6. A biotin control antibody did not affect (agrin dependent) MuSK phosphorylation. Monovalent Fab fragments generated from these recombinant MuSK monoclonals inhibited MuSK phosphorylation (C). Agrin-dependent AChR clustering was unaffected when exposed to a biotin control antibody or Fab fragments thereof. Bivalent monospecific recombinant IgG4 MuSK antibodies and Fab fragments inhibited the number of agrin-dependent AChR clustering significantly compared with the biotin control antibody (for IgG4: p < 0.001, for Fab fragments: p < 0.001, one-way analysis of variance (ANOVA) test, Dunnett corrected). Fab fragments reduced AChR clusters to the level of purified patient IgG4 and the “no agrin” condition. Bivalent monospecific antibodies significantly increased AChR clustering compared with Fab fragment–mediated inhibition that seems independent from agrin (D & E; 11-3F6: p < 0.001, 13-3B5: p = 0.03, biotin antibody: p = 0.30, unpaired t test, no agrin conditions 11-3F6: p = 0.03, 13-3B5: p = 0.20 one-way ANOVA Dunnett corrected). Data represent mean ± SEM. Scale bar represents 50 μm. AChR = acetylcholine receptor; MuSK = muscle-specific kinase. Recombinant monoclonal IgG1 and IgG4, however, both engage in bivalent monospecific antibody-antigen interactions. To investigate the functional effects of the bispecificity and functional monovalency of Fab-arm exchanged IgG4 MuSK antibodies in patients, we generated monovalent Fab fragments from these recombinant antibodies by papain digestion. In vitro, these Fab fragments inhibited agrin-dependent MuSK phosphorylation (figure 2C) and AChR clustering similar to patient serum-derived MuSK IgG4 (figure 2D). 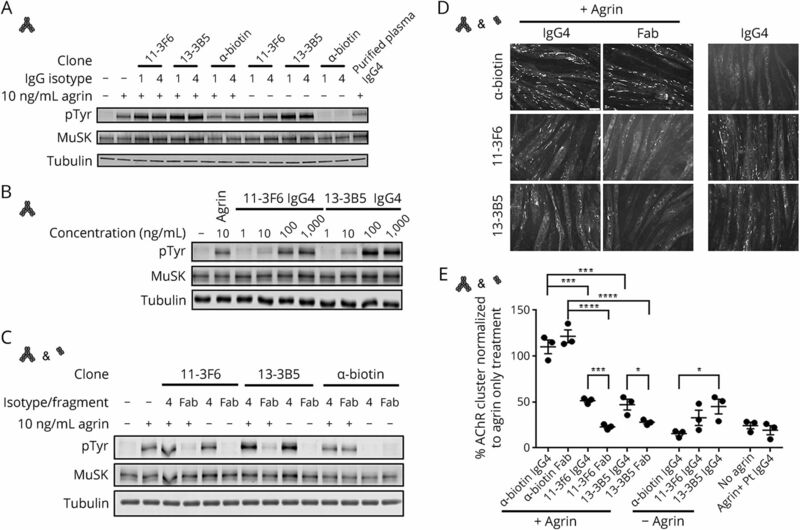 Despite fully activating MuSK phosphorylation, bivalent monospecific MuSK antibodies partially inhibited agrin-dependent AChR clustering as compared to Fab fragments and a biotin control antibody. Importantly, that AChR clustering could be partially induced using bivalent monospecific antibodies independent from agrin (figure 2D). Thus, monovalent MuSK binding blocks MuSK signaling and the AChR clustering pathway, whereas bivalent monospecific MuSK antibodies fully stimulate MuSK phosphorylation and partially induce or restore AChR clustering in this tissue culture model. In this study, we provide new and surprising insight on the disease mechanism of MuSK MG by functional characterization of patient-derived monoclonal MuSK antibodies. The major findings of this study are graphically depicted in figure 3. Previous studies with polyclonal purified IgG4 from patients with MuSK MG showed that this IgG4 obstructs Lrp4-MuSK binding.8,9 This interaction is normally required for MuSK to become dimerized and phosphorylated. Polyclonal patient IgG4, by blocking Lrp4-MuSK interaction, prevents MuSK dimerization, phosphorylation, and subsequent signaling toward AChR clustering leading to muscle weakness. Experiments by others furthermore confirmed that polyclonal MuSK IgG4 antibodies in patient serum have undergone Fab-arm exchange14 and thus are functionally bispecific, binding to MuSK in a monovalent manner. We here show that monovalent Fab fragments, generated from patient-derived monoclonal MuSK antibodies, mimicked monovalent Fab-arm exchanged serum IgG4 and recapitulated the pathomechanism of MuSK MG. Surprisingly, bivalent patient-derived monoclonal MuSK antibodies had the complete opposite effect. These antibodies activated, rather than inhibited MuSK phosphorylation and partially induced AChR clustering. As MuSK phosphorylation and signaling requires MuSK dimerization, our data suggest that bivalent monospecific MuSK antibodies can force this dimerization, thereby stimulating MuSK phosphorylation and AChR clustering. This bypasses the need for agrin-bound Lrp4 to interact with MuSK. Because Fab-arm exchange renders circulating IgG4 functionally monovalent, serum MuSK IgG4 is unable to force dimerization and blocks MuSK signaling. Our data suggest that IgG4 MuSK autoantibodies become pathogenic when, due to Fab-arm exchange, they have become more functionally monovalent. MuSK autoantibody valency and, consequently, MuSK autoantibody subclass are thus key determinants in the pathogenic mechanism underlying MuSK MG. Inhibition of Fab-arm exchange might therefore have therapeutic potential in MuSK MG and perhaps also in other identified IgG4-mediated autoimmune disorders.17,18 Our experiments do not exclude the possibility that the low levels of IgG1-3 MuSK antibodies might damage NMJs through activation of complement or immune cell–mediated cytotoxicity. The agonistic (i.e., bivalent) patient-derived MuSK monoclonal antibodies did not induce AChR clustering in the C2C12 myotube assay to the same degree as the natural agonist agrin. This is likely not a dose-dependent potency difference (data not shown). Alternatively, binding of bivalent monospecific antibodies to the Ig-like 1 domain of MuSK might affect downstream aspects of the AChR clustering pathway differently from agrin-induced MuSK stimulation. These results show strong similarities to a study using IgG obtained from an active immunization model of MuSK MG in rabbits,19 to studies showing functionally bivalent antibodies binding the MuSK extracellular domain,20,21 and to in vitro studies with polyclonal purified patient IgG1-3 fractions.9 One explanation for the incomplete AChR clustering ability of these MuSK antibodies may be reduced Dok-7 protein levels, a protein acting downstream of MuSK essential for transducing the AChR clustering signal.19 It is conceivable that binding of bivalent monospecific MuSK antibodies alters the interaction between MuSK and Dok-7 or might increase MuSK internalization and affect subsynaptic gene expression, ultimately lowering AChR cluster numbers.11 It will furthermore be important to learn whether the level of AChR clustering that can be achieved with patient-derived bivalent monospecific MuSK antibodies is sufficient to maintain adequate neuromuscular transmission in vivo. MuSK autoantibodies can also inhibit MuSK–collagen Q interaction.24 It will be interesting to study the effect of these monoclonal antibodies on this interaction. Furthermore, although the Ig-like 1 domain of MuSK is considered the MIR, antibodies to other parts of the ectodomain of MuSK have been found.6,25,26 The here described methodology should enable isolation of MuSK monoclonal antibodies binding to different MuSK domains, which will facilitate more detailed analysis of their (pathogenic) effects. The frequency of MuSK-binding memory B cells was low in the patients studied. This may be explained by the immunosuppressive medication that the patients received. Both patients had, despite this medication, rather high levels of MuSK autoantibodies. Lighaam et al.12 showed that numbers of circulating IgG4 memory B cells tightly correlated with IgG4 titers. This might, however, not reflect individual antigen-specific responses. As plasma cells mostly reside in the bone marrow, the isolation of circulating memory B cells might not be a representative of the ongoing MuSK autoantibody production. We can also not exclude that the experimental procedures affected the number or isotype of the isolated MuSK-binding cells. Experiments testing the isolation and culture of IgG1 and IgG4 memory B cells using this method did show a slight (∼10%) survival advantage for single IgG1 memory B cells (data not shown); however, this is not sufficient to explain the lack of IgG4 MuSK-binding memory B cells isolated in these experiments. At least 12 other autoimmune diseases affecting different organ systems are hallmarked by pathogenic IgG4 autoantibodies.17,18,29 For several of them, patient-derived monoclonal antibodies have been isolated and characterized.30,31 The VDJ gene usage differs between all these diseases. It is not known why these diseases are caused by IgG4 autoantibodies. The role of antibody valency for these diseases has only partially been studied. In pemphigus vulgaris, where the antigen forms a heterodimer (in contrast to MuSK, which forms a homodimer), pathogenicity seems more dependent on autoantibody titer and epitope.18 It will be interesting to learn whether autoantibody valency and thus Fab-arm exchange is relevant in other IgG4-mediated autoimmune diseases. In conclusion, the pathomechanism of MuSK MG is dependent on at least 3 factors: (1) autoantibody titer,6,32 (2) recognized epitope,6,8,22 and, emerging from this and other9,19 studies (3) antibody valency/autoantibody subclass. This study thereby presents a new pathomechanism in antibody-mediated autoimmunity, requiring Fab-arm exchange of IgG4 to render autoantibodies monovalent and pathogenic. M.G. Huijbers designed and analyzed experiments and wrote the manuscript. D.L. Vergoossen and Y.E. Fillié-Grijpma performed and analyzed experiments. I.E. van Es performed experiments. M.T. Koning designed, analyzed, and advised on experiments. L.M. Slot designed and advised on experiments. H. Veelken provided material and wrote the manuscript. J.J. Plomp analyzed the data and wrote the manuscript. S.M. van der Maarel and J.J. Verschuuren designed experiments, analyzed the data, and wrote the manuscript. This work was supported by the Prinses Beatrix Spierfonds and the LUMC. M.G. Huijbers is coinventor on several patent applications related to MuSK MG pathogenesis. D.L. Vergoossen, Y.E. Fillié-Grijpma, and I.E. van Es report no disclosures. M.T. Koning received research support from the Professor Steenhuis Fund. L.M. Slot and H. Veelken report no disclosures. J.J. Plomp has 2 patents pending on the pathomechanisms of MuSK MG antibodies. S.M. van der Maarel served on the scientific advisory boards of the Prinses Beatrix Spierfonds, CORT, MRC Centre for Neuromuscular Diseases, Dutch CAA Foundation, and Spierziekten Centrum Nederland; served on the editorial board of Neuromuscular Disorders; is coinventor on several patent applications related to FSHD and to MuSK MG; and is a nonexecutive board member of GenomeScan. J.J. Verschuuren served on the scientific advisory board of the Myasthenia Foundation of America; is on the editorial board of the Journal of Neuromuscular Diseases; holds a patent for MuSK myasthenia gravis; received research support from the Princes Beatrix Spierfonds, LUMC receives payments from Alexion, argenx, Ra Pharma due to consultancies, LUMC received royalty payments for development of MuSK Diagnostic Antibody test for TECAN/IBL. Full disclosure form information provided by the authors is available with the full text of this article at Neurology.org/NN. The authors thank Rochelle Vergroesen, Lise Hafkenscheid, Joris Schonkeren, Prof. Jelle Goeman, and Prof. Rene Toes for their valuable advice on this project, Dr. Konstantinos Lazaridis and Prof. Socrates Tzartos for the MuSK protein, Prof. Steve Burden for the immunoprecipitation antibody, Edwin de Haas for assistance with FACS sorting, Dr. Theo Rispens for his valuable advice and expression vectors, and the Prinses Beatrix Spierfonds (W.OR17-13) and the LUMC for supporting our work financially.
. Auto-antibodies to the receptor tyrosine kinase MuSK in patients with myasthenia gravis without acetylcholine receptor antibodies. Nat Med 2001;7:365–368.
. Detection and characterization of MuSK antibodies in seronegative myasthenia gravis. Ann Neurol 2004;55:580–584.
. The immunobiology of immunoglobulin G4. Semin Liver Dis 2016;36:200–215.
. Anti-inflammatory activity of human IgG4 antibodies by dynamic Fab arm exchange. Science 2007;317:1554–1557.
. Acetylcholine receptors loss and postsynaptic damage in MuSK antibody-positive myasthenia gravis. Ann Neurol 2005;57:289–293.
. Longitudinal epitope mapping in MuSK myasthenia gravis: implications for disease severity. 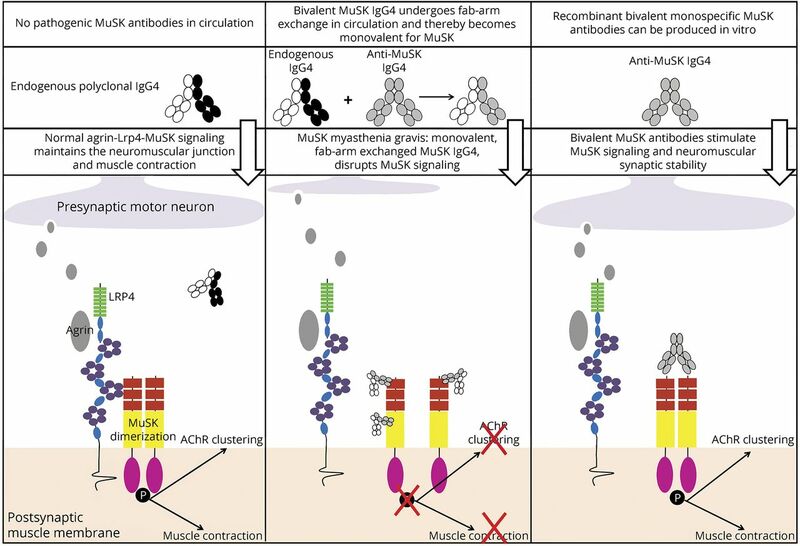 J Neuroimmunol 2016;291:82–88.
. Muscle-specific kinase myasthenia gravis IgG4 autoantibodies cause severe neuromuscular junction dysfunction in mice. Brain 2012;135:1081–1101.
. MuSK IgG4 autoantibodies cause myasthenia gravis by inhibiting binding between MuSK and Lrp4. Proc Natl Acad Sci USA 2013;110:20783–20788.
. MuSK myasthenia gravis IgG4 disrupts the interaction of LRP4 with MuSK but both IgG4 and IgG1-3 can disperse preformed agrin-independent AChR clusters. PLoS One 2013;8:e80695.
. Collagen Q and anti-MuSK autoantibody competitively suppress agrin/LRP4/MuSK signaling. Sci Rep 2015;5:13928.
. 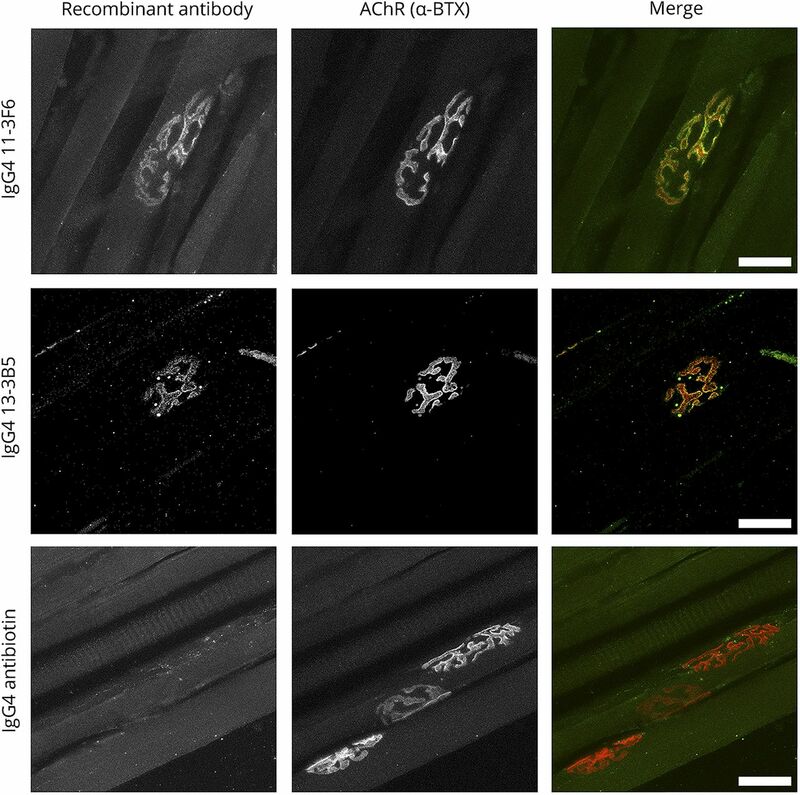 Patient autoantibodies deplete postsynaptic muscle-specific kinase leading to disassembly of the ACh receptor scaffold and myasthenia gravis in mice. J Physiol (Lond) 2010;588:3217–3229.
. Phenotypic differences between IgG4+ and IgG1+ B cells point to distinct regulation of the IgG4 response. J Allergy Clin Immunol 2014;133:267–270.
. ARTISAN PCR: rapid identification of full-length immunoglobulin rearrangements without primer binding bias. Br J Haematol 2017;178:983–986.
. IgG4 autoantibodies against muscle-specific kinase undergo Fab-arm exchange in myasthenia gravis patients. J Autoimmun 2017;77:104–115.
. Variable domain N-linked glycans acquired during antigen-specific immune responses can contribute to immunoglobulin G antibody stability. Front Immunol 2018;9:740.
. Fundamental molecules and mechanisms for forming and maintaining neuromuscular synapses. Int J Mol Sci 2018;19:E490.
. The expanding field of IgG4-mediated neurological autoimmune disorders. Eur J Neurol 2015;22:1151–1161.
. IgG4-mediated autoimmune diseases: a niche of antibody-mediated disorders. Ann N Y Acad Sci 2018;1413:92–103.
. Divalent and monovalent autoantibodies cause dysfunction of MuSK by distinct mechanisms in a rabbit model of myasthenia gravis. J Neuroimmunol 2012;244:1–7.
. Dimerization of the muscle-specific kinase induces tyrosine phosphorylation of acetylcholine receptors and their aggregation on the surface of myotubes. J Biol Chem 1998;273:6467–6473.
. The juxtamembrane region of MuSK has a critical role in agrin-mediated signaling. EMBO J 2000;19:67–77.
. Direct demonstration of MuSK involvement in acetylcholine receptor clustering through identification of agonist ScFv. Nat Biotechnol 1997;15:768–771.
. Preserving neuromuscular synapses in ALS by stimulating MuSK with a therapeutic agonist antibody. Elife 2018;7:e34375.
. Anti-MuSK autoantibodies block binding of collagen Q to MuSK. Neurology 2011;77:1819–1826.
. Clinical and experimental features of MuSK antibody positive MG in Japan. Eur J Neurol 2007;14:1029–1034.
. Antibodies against Wnt receptor of muscle-specific tyrosine kinase in myasthenia gravis. J Neuroimmunol 2013;254:183–186.
. Autoantibody-producing plasmablasts after B cell depletion identified in muscle-specific kinase myasthenia gravis. JCI Insight 2017;2:94263.
. Dysregulation of B Cell repertoire formation in myasthenia gravis patients revealed through deep sequencing. J Immunol 2017;198:1460–1473.
. New classification system for IgG4 autoantibodies. Front Immunol 2018;9:97.
. Pemphigus autoantibodies generated through somatic mutations target the desmoglein-3 cis-interface. J Clin Invest 2012;122:3781–3790.
. Genetic and functional characterization of human pemphigus vulgaris monoclonal autoantibodies isolated by phage display. J Clin Invest 2005;115:888–899.
. Anti-MuSK antibodies: correlation with myasthenia gravis severity. Neurology 2006;67:505–507.